Way to go. It IS such a bother answering all those child rearing questions! LOL. Ok, no fair making me choke because I'm laughing too hard. Ha! how about, "Worry? Naw. That wall's solid brick. Most they can do is scratch it." haha ha!!!! Apparently my computer is having seizures, so I may not get this cooment put it. I love it! Sometimes you just have to let it go. I find it hard to do, but admire those who can!! We have had suckish snow this year too. Ah, a mama after my own heart! I enjoyed a great laugh at this one. That is my philosophy EXACTLY. At the bottom of our Atlanta sledding run was a choice of chain link fence or metal light post, or four feet of clearance to get between them. I didn't watch either. When I was a kid there was a creek (sometimes frozen, sometimes not) at the bottom of mine. You play great defense. Seriously. I grew up with a massive hill with a stonewall at the bottom. 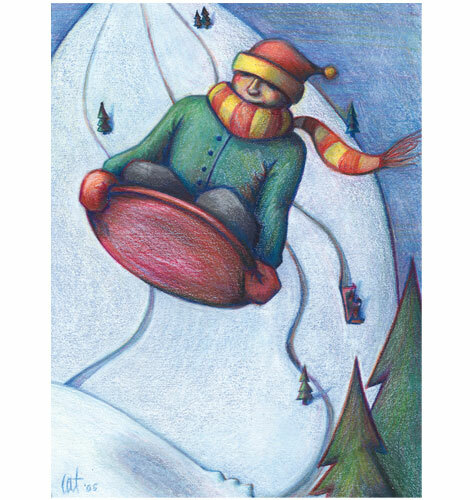 Half the fun of careening down the slope on the toboggan was waiting to hear the word, "Bail!" to know when you needed to roll off. This way, you're not depriving them of memories like these. We seem to share a parenting style, except that I'd probably be out there taking pictures for at least a few minutes of the fun before ignoring them completely. Hahahaha! I love that. This really did make me LOL. We used to take the snow mobile and pack down a sledding track around the barn and down the hill on our farm in pennsylvania. Then we would spray water on the trail before use. We survived. I can't bear to watch, either. Or to listen.